The mission and history of the Atlantic District of the Lutheran Church Missouri Synod(LCMS) has been one of welcoming and embracing each wave of immigrants and newcomers from around the world. Covering metropolitan New York, Long Island, the Hudson Valley and the Capital Region, the Atlantic District is set in one of the most diversely populated areas on earth. With over 100 congregations and missions, the work of the Atlantic District is boundless, bringing God's Word and Love to people from all walks of life. 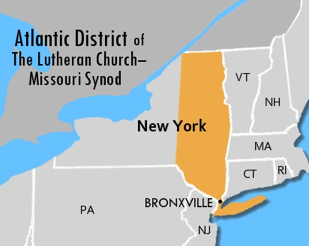 Whether it's setting up new churches, or ministering to existing congregations, the Atlantic District also reaches out to the many ethnic and religious groups in New York so they may know Jesus Christ! Among the many Atlantic District missions are ministries to Hispanic, African immigrant, Asian and Deaf communities. The Great Commission tells us to, “Go and make disciples of all nations, baptizing and teaching.” The Atlantic District of the LCMS seeks to fulfill this command by reaching out into the neighborhoods around us, because all nations reside there. The mission and history of the Atlantic District has been one of welcoming and embracing each wave of immigrants and newcomers from around the world by boat, plane or foot. The Atlantic District seeks to reach out with the Gospel of Jesus Christ in the midst of one of the most densely populated, ethnically diverse areas of the country. The Atlantic District is the eastern half of New York State including the Adirondacks, Capital Region, Hudson Valley, Westchester County, the five Burroughs of New York City, Nassau and Suffolk counties of Long Island. There are 11 missionaries to various cultural groups directly supported by funds from the Atlantic District Mission Society. These missionaries and our parishes baptize adults, youth and babies from no faith and other faiths like Islam, Buddhism, Hinduism, and others. Together we seek to serve those around us with the gospel in word and deed. Christ sends us out from His altar, pulpit and font, to serve the community and neighborhoods around us with the love and forgiveness that Christ has given us. Thousands of people come to know the love of Jesus through the service of our Lutheran Schools and Social Ministries like: Concordia College – NY; Martin Luther High School; Long Island Lutheran High School; Lutheran Counseling Center; Lutheran Friends for the Deaf; Lutheran Services NY Alliance; Lutheran Social Services NY; Our Savior High School, Centereach; Our Saviour High School, The Bronx; The Lutheran Care Network; The Wartburg and many many others. The harvest is truly plentiful, but the laborers are few. As we look toward the future, the Atlantic District recognizes that times are changing and yet the message remains the same. The same Jesus that died for the sins of the world, died for the sins of the people today. As we strive to serve the needs today, we look at redeveloping properties to provide: affordable housing; partnerships with schools; senior housing; and community meeting areas. These are opportunities to share the hope of Jesus Christ into the lives of people. The Atlantic District's congregations, workers and agencies share God's grace in Christ Jesus to nurture Christians and reach out to others. dynamic agencies that are committed to partnerships in the Gospel that edify the faithful while transforming our society. Passed at the September 29, 2011 Board of Directors Meeting of The Atlantic District, LCMS. Mission Society — raising up prayer and money for missions. Supports the Mission of the Communications Task Force—TF#6—which is available to advise and assist congregations with web page design, marketing skills and commonly used church software.